Hailing from Chicago, Brian and his wife, Jodie, moved to Colorado in 2012 as a result of listening to whispers of God. Leaving a church that they loved and helped plant, as well as close friends and family, God opened the doors of opportunity at Rev5, and the Steck’s jumped through. With a pastor’s heart for discipleship and shepherding, Brian brings passion for living a lifestyle of worship, training young men to be Kingdom warriors, raising up leaders, teaching financial stewardship, redeeming Godly marriages, practicing soul care as well as emotional health, hard work and even harder play. 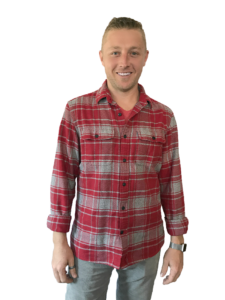 Along with his wife, Brian enjoys healthy doses of ultimate frisbee, hiking, coffee, great music and web development at his company, Steck Insights Web Design. His ministry history includes worship leading and small group leading at Willow Creek Community Church, Cherry Hills Community Church and Hawthorn Hills Community Church/The Chapel (among others), long-term missions with International Teams in Mexico, missional community hub leading and serving as treasurer and secretary at Mission Church in Chicago.